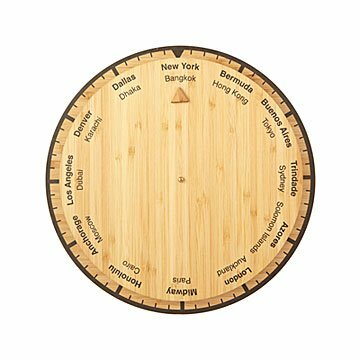 This sleek bamboo clock shows you the time in every time zone around the world. Shanghai for a morning meeting, then it's off to Paris for Fashion Week. Side trip to Milan for gelato? Ciao, baby! Your passport has more stamps than your fro-yo card. Hang Mike Jensen's sleek bamboo clock in your home or office as inspiration for your next adventure— it shows you the time in every time zone around the world. Now, if only it cured jet lag, too. Made in Charlottesville, Virginia.